The support vector machine (SVM) is a predictive analysis data-classification algorithm that assigns new data elements to one of labeled categories. SVM is, in most cases, a binary classifier; it assumes that the data in question contains two possible target values. Another version of the SVM algorithm, multiclass SVM, augments SVM to be used as classifier on a dataset that contains more than one class (grouping or category). SVM has been successfully used in many applications such as image recognition, medical diagnosis, and text analytics. Suppose you’re designing a predictive analytics model that will automatically recognize and predict the name of an object in a picture. This is essentially the problem of image recognition — or, more specifically, face recognition: You want the classifier to recognize the name of a person in a photo. Well, before tackling that level of complexity, consider a simpler version of the same problem: Suppose you have pictures of individual pieces of fruit and you’d like your classifier to predict what kind of fruit appears in the picture. Assume you have only two types of fruit: apples and pears, one per picture. Given a new picture, you’d like to predict whether the fruit is an apple or a pear — without looking at the picture. You want the SVM to classify each picture as apple or pear. As with all other algorithms, the first step is to train the classifier. Suppose you have 200 pictures of different apples, and 200 pictures of pears. The learning step consists of feeding those pictures to the classifier so it learns what an apple looks like and what a pear looks like. Before getting into this first step, you need to transform each image into a data matrix, using (say) the R statistical package. A simple way to represent an image as numbers in a matrix is to look for geometric forms within the image (such as circles, lines, squares, or rectangles) and also the positions of each instance of each geometric form. Those numbers can also represent coordinates of those objects within the image, as plotted in a coordinate system. As you might imagine, representing an image as a matrix of numbers is not exactly a straightforward task. A whole distinct area of research is devoted to image representation. 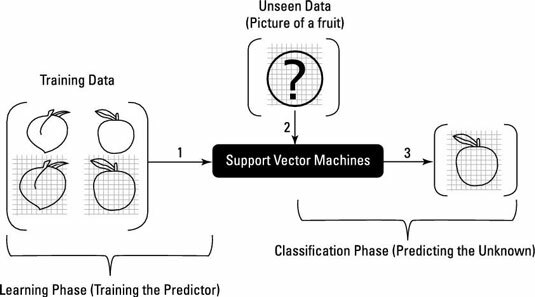 The following shows how a support vector machine can predict the class of a fruit (labeling it mathematically as apple or pear), based on what the algorithm has learned in the past. Previous (training) data: This set of matrices corresponds to previously seen images of apples and pears. The new (unseen) data consists of an image converted to a matrix. The purpose is to predict automatically what is in the picture — an apple or a pear. The support vector uses a mathematical function, often called a kernel function which is a math function that matches the new data to the best image from the training data in order to predict the unknown picture’s label (apple or pear). In comparison to other classifiers, support vector machines produce robust, accurate predictions, are least affected by noisy data, and are less prone to overfitting. Keep in mind, however, that support vector machines are most suitable for binary classification — when you have only two categories (such as apple or pear).